230 out of 230 (100.00%) customers would recommend this product to a friend. I have used several recycle cartridge companies. and the quality of the Ink Technologies cartridge is far superior and the price is one of the lowest. Seems like a good product. Certainly much cheaper than the alternatives. Will see if it holds up over the long run. The Compatible Brother Toner Cartridge is just as good as the Brother brand in quality. Can't beat that! Quality of product is equal to the original toner. Can't beat the price also. Everything was excellent - there's not a single bad thing to say,only praise! I have never had any problems with this compatible toner cartridge. Excellent price vs. the name brand. Great product at good price. Excellent service and delivery too! Thought I’d try a recycled cartridge from Ink Technologies since the factory ones are so expensive. And I’m very glad that I did. Cannot tell any difference in the print quality. Highly recommended! So far.after two orders I'm very satisfied with ink and how quick you get it.Yes, I would recommend this product. I felt the toner was equal in quality to the Brother toner and it gave me clear copies. I would recommend the toner to anyone who needs to replace their toner. Safe packaging and fast shipping. Easy to understand installation instructions for quick replacement. Quality prints. VERY reasonably priced!!! Wonderful quality, prompt service... excellent. An excellent product at a very reasonable price. The print quality from this toner cartridge has been great, and the price was way lower than the store in town. This toner works great with my Brother printer. I've been ordering from Ink Technologies for years and I've never had a problem. No sense in purchasing the brand name when a comparable one is just as good! Quick delivery, good quality and a great price. We enjoy this company, website is so easy to use with good prices and fast shipping. I have been using this product for a few years now and have never had a problem. Always great prices and trusted quality. Will shop here again in the future. I receive the toner quickly! The product runs well! Worked great, especially for the price. I am a teacher on a fixed income but this made color printing economical. I purchased 4 laser cartridges for the price of one at a local store. I installed one cartridge immediately and the print quality was perfect. I'll be back!! The price really knocked my socks off, and after using the printer I could not believe the great quality job it does. I have reccomended to other associates about your company, and how quickly my order arrived. Thanks Again,your a #10 in my book!! Awesome product will use again. Excellent customer service thanks for your help, will always recommend your product! This toner cartridge is an excellent value for our Brother fax machine. The bottom line is, it does the job and saves us money.I would recommend this product to friends and family. I have been purchasing toner and ink exclusively from Ink Technologies for the past 15 years and have always been 100% satisfied with each purchase. Keep up the good work! This is a good valued product. My print outs are clear and vivid. This price I paid is almost half compared to that of other office stores for the same quality. I bought this toner cartridge at the beginning of the year, and the ink is still lasting a long time. These cartridges are just as good as buying new. Once I had an issue with a cartridge and Ink Technologies replaced it immediately. I wasn't sure when I bought it, but I fell for the satisfaction guarantee. But I was very surprised that it's the same or better quality than the original Brother. I have it already a few months I think it lasts much longer. I print on an average business day like 45 pages. No smudges etc. Wouldn't buy Brother OEM again, it's a waste of money. This is the best I tell this to everybody who needs toner. Ink Technologies is my go to for ink. I use 2 laser printers and 1 MFC, Ink Tech prices can not be beat. I have never had 1 problem with their cartridges. All works well. No issues with the toner cartridges. Glad I gave a compatible toner a try. Very satisfied with print quality! Definitely will buy again. I have never bought better. Service was fast, correct, as promised. If you need toner, this is the place to be. Received the product quickly and it was an easy install. No problems at all. Print quality is good also. The toner works. It arrived quickly. Life goes on well in the printer area. Very satisfied with this toner. I will order again. These ink cartridges last a long time and are always delivered on time. InkTechnologies is the best place to order these cartridges! Package came sooner than expected. I was able to load it and use it immediately. Excellent quality cartridges. Will continue to purchase them as they perform as advertised. This toner gave me good value for my money, it was high quality and a good low price. Ink cartridge easy to install and fit Brother MFC 7360N just fine; ink quality ok, happy to continue using Ink Technologies products. Great quality printer cartridge for my Brother printer that does the heavy lifting around here for printer work. I ordered the ink and was kind of skeptical because it seems to inexpensive to be a good product. But I figured i would only be out $17 if it was no good. Well... it works great. I put it in the first time and the printer didn't seem to recognize that I put a new one in... but I took it out and re-seated it and it worked fine. The printed pages are coming out great. I have no complaints. The cartridge was as good as the oem, but much less expensive. I would certainly recommend it to everyone. I have purchased many of these for a business office over several years...never a problem and the ink is just as bright as oem. Good value for the price. I've bought these cartridges from Ink Technologies for several years now and have never had any problem with them. As far as I can tell, they're just as good as the more expensive brand name cartridges. The toner cartridges work excellent with our printers. No hassle customer service. They are easy to install and give excellent print quality. I have been ordering the Compatible Brother Toner Cartridge for years. These work great, and the price cannot be beat compared to purchasing an original Brother toner. Would highly recommend Ink Technologies for this product! This print cartridge was easy to install and performed as well as the original cartridge that came with my printer. A good bargain! Product came very fast. Easy to do business with. Good price, good quality. Next day delivery. I purchased this product for my college-age daughter. It has performed flawlessly since it was installed - and she does a LOT of printing. I fully intend to keep on buying this product for as long as her printer continues working, and recommend this product to anyone considering it. The high capacity toner cartridges lasted as long as guaranteed and cost much less than the cartridges purchased through the office supply store. The ink cartridge is comparable to the name brand item. The cost was considerably lower than the name brand. I ordered this for my Brother printer. The price is very reasonable, and deliver prompt. Good product - excellent value for the price and worked well. Great products with a great value and we will continue to use. This product performs exactly like the original manufacturer's product for a fraction of the cost. I will buy again and again. Excellent product, quick delivery, gives long life. These worked pretty much like the OEM product. The cartridge was inexpensive for a laser cartridge, and it fit perfectly. It prints clearly and works well so far. Good price and quality, fast and reliable service. Like most small businesses, our team is on a fixed operating budget. Using your ink and toner helps us get the most of our printing dollar. Could not tell a difference from OEM. Great product! My order came in on time and works fine. Great savings. Excellent product value. We have used these toners for years...a much better value than name brand toners. Although there is a local toner replacement store here in town, Ink Technologies has the better refurbished products for the price. I can get almost twice the toners as I can from the other store. I print a lot, so I need a cheap reliable source for my toner needs. Next order, a new drum. Super fast delivery. Very satisfied. The toner cartridges that came with my Brother MFC-9130CW printer were used up fairly quickly so I immediately went to Ink Technologies to purchase replacements. So thankful I did! The replacement cartridge went in easily and the prints look great. Thank you for a fully functional and more economical alternative! These cartridges seem to work fine. I don't count the number of copies so I don't know if they really copy as many as the OEM cartridges. The quality is as good as buying directly from Office Depot, but at a much better bargain price! Product works like OEM product. Much cheaper than the OEM product. Ink Technologies makes the whole process cheap and easy! This product is excellent. I am not reordering again right now because the last time I ordered this product I bought too many Items. My order was delivered quickly and the toners work wonderful. I have purchased these often and never with any problems. I have used other replacement cartridges from other companies over the years and have found Ink Technologies to be the most reliable. Strong, durable, packaged appropriately, shipped conservatively, ordered reliably. Have purchased before and no difference from the manufacturer product. Good for heavy office use. Purchased to see how it would work as price compared to OEM was good. Put in and the printing looks as good as OEM. Don't know about yield as I don't print all that much. Great value for the product selected. Works as well as the high priced from the large stores. Easy to contact. They back their toner product. Seems like a reliable company. I will use again. I use this toner for my accounting and tax business- no problems, great quality and can't beat the price! This is an ink cartridge that I do not even think about! I have not found a reason to be concerned because my printing result have been fine quality, consistent, and dependable with no experience of degradation of printed results nor concerns over replacements. It has worked well with my printer(s). Highly recommended. The product works just fine. No need to waste money on the big shops. I purchase all toners from Ink Technologies. Perfect way to save money for small businesses. I have been a client for Ink Technologies for over 5 years and always I receive the same good service, quality products, and on time shipping. No differences noticeable from Brother product. This product work excellent for the price. Excellent replacement. No problems. Great quality. The product is way cheaper in price than any other website. It works just as good as any expensive ink cartridge. I always order from here. Great product for a great price. You really get as many or more copies from this remanufactured cartridge as you do the original. I have recommended this product to several of my friends. Excellent pricing for product, almost getting a BOGO price. Easy order/processing of product and quickness of delivery makes for automatic reorder for me. The Brother compatible toner is a definite value. No difference in print quality from original. I recommend this product highly as well as all Ink Technologies' products. I like the product fine for my purposes. The letters are not as dark as with the Brother toner. My only regret is not having an opportunity to recycle the product. Easy to put into my HP printer. Quality is equal to an HP replacement. Very satisfied with this product and will gladly recommend to friends & others. Easy to replace, works every single time. I bought this cartridge several times and all have worked flawlessly. Excellent value. Fast shipping. Great company to work with. The quality is excellent and the price can't be beat! I bought these products because I knew that they're cheaper than the original. The quality is the same as the original. However, this product lasts way longer than the original. It yields way more copies than the original. I definitely recommend this for small business owners trying to save money. Toner lasts as long as toner purchased at a retail store. I have ordered this toner many times and have never had any problems. I have been purchasing refurbished TN450's from here for quite awhile with great results. Work just as OEM. The products performance and cost were excellent. Thank you all for such a superior product. These cartridges are almost 1/2 price of what I can find local. Great product for the price. Will never pay full price again at the big box office stores again. We saved about half the cost of going to Staples to buy this product. We will continue to order all of our necessary printing supplies from Ink Technologies. Super good, very affordable prices and quality is excellent. Bought this toner after reading some online review, no regret. Good quality at a good price. Excellent value, good product and reasonably priced. Website is easy to navigate through and order products. Product arrives timely and is overall good. I've been a customer of Ink Technologies for several years now. For the printing I need to do in my home office I use a laser printer, black only. The value and quality I get from IT allows me to print as much as I need, quickly and efficiently. This is such a good buy. I will always buy from here. Just as good as the name brand product at a fraction of the price. Product arrived professionally packaged and in a timely manner. Will reorder every time and tell all my friends. We are very happy with the toner, we have no complaints. No dislikes and we would recommend this product to anyone who would have need for it. We chose our ratings because there is always room for improvement and products are always changing to make them better. I feel they are good ratings and we are very satisfied. Thanks for your assistance. Best price for your money and last just as long as the name brand. Very glad we are using your company, no more driving to go get ink. Price is worth the quality. Love this company. I wasn't sure if an "equivalent" ink cartridge would be as good as a Brother ink cartridge. However, it prints just as well if not better than the manufacturers cartridge. I will definitely be ordering more in the future. Met all my expectations with a quick delivery. The Brother brand toner cartridge I bought was just great. It printed clearly and without issue for months. The only "issue" of sorts is that the cartridge received is generic, though of high quality, but was not recognized by the copier. It gave a warning "change toner" from the beginning, but performed without hitch. The price difference in purchasing from Ink Technologies and ANYWHERE else is just tremendous. I paid only a third of what I had been paying for the same product and this is so much more convenient too. The cost, performance, number of sheets to print, ease of install, delivery were outstanding. The product arrived on the date stated at time of purchase. Boxes in good shape. I have not used these cartridges yet, but compatible cartridges purchased in the past worked well. I am assuming these cartridges will work just as well. Great price and quality. Have had no problems and would buy again. I have been using these catridges for awhile with no problems. Save money. Just as good as Brother for much less money. My replacement toner cartridge was shipped the same day I ordered it. Arrived promply. The ink is printing beautifully in my Brother printer. Saved alot of money on ink. I will absolutely buy from you again. Thank you for great service. I bought this and thought it was the wrong model for my printer. After calling customer service, the told me how to put it in, and it works like a champ. Quality has been consistent, lasts longer than expected. Happy with toner, great value and shipping. The quality is as good as the original but yet the price is much cheaper. Very good product and very reasonable in price. Great everything! I am going to keep buying! I have been ordering from here for years now. This ink lasts long and I have not had any problems with it. The print quality is great - as good as higher price compatible product. I mean, if you gotta buy printer toner, why pay the high prices. This works as well or better. I recommend this to anyone looking for the product - it is cheap and works great. These toner cartridges are a great value for the money. They cost about half as much as the Brother cartridges and perform with the same quality. The product has been amazing! Once in a while I'll get one that leaks but Ink Technologies is quick and efficient about getting a free replacement to me. Good price, great product. Will buy again. Great prices! Super fast delivery! Easy reorders on the website! So glad I found you! This is an excellent product. I like the results of the printed copy. You can not tell the difference from a high quality print and the quality of this desktop print. I would recommend this to anyone that wants to save money but yet have a good quality printed copy at the same time. Works great, will buy again. I have used Ink Technologies for years, prices are great, service and delivery is outstanding. This product is a great value for the price. I'm totally sold on Brother printers, but their OEM toner cartridges are too expensive. I'm pleased to get them from Ink Technologies at about half the price. Though I just started using the cartridge, I am very pleased with the quality of the print and the item was packaged very carefully, better than any I've gotten from the store. So far so good! These products are superior to brand name products, all at a better price. A good product with good price, worthy to have and to buy again. Excellent purchase price and I received the printer cartridge quickly. My school does not buy toner cartridges without a whole lot of hoopla so I just buy them myself. What a great deal for "poor" teachers or anyone for that matter! A high quality product.I like everything about it.I would recommend this product to anyone.Great value. Love Love Love these toners, I am in nursing school and print out an abundance of powerpoints and notes, these last forever it seems like. I am sure that I get more yield than what they have listed. Great money savers!!! I choose this rating because that's how much I like ordering from your business. The price is much lower than other competitors. Great Products! Fast delivery and great price! This cartridge works as good as the original. It installed easily and the print quality is amazing. Do not hesitate to save yourself some money and buy this product. This is my first time to try Ink Technologies. So far, they work great...no problems. Reliable product with excellent service and delivery for the best prices around. The products work perfectly. Now I need to order for my other printers. Great product, no problems. Fast Shipping. Great service, like the fact my order came fast, I would recommend to all small businesses. These toner cartridges are a great value for the money. These were the cheapest cartridges I could find and the quality is just as good as the more expensive ones. I have used this toner for two years. I see no difference in quality versus toner purchased in store EXCEPT the price. I recently bought additional cartridge for my grand-daughter in college. Great product! Never had any problems with the remanufactured toners. Great toner!! Great price!!! Quick shipping. The toners print the amount of pages exactly as promised. The price is remarkable! This cartridge is just as good as a Brother at a much better price. Delivered in 2 days, arrived exactly as ordered. Easy instructions for replacing old cartridge. Print quality excellent. Will definitely use Ink Technologies for my supplies in the future. Absolutely love the price and quick shipping. I will definitely buy again. Great price. Toner works great, easy to order, quick timely delivery. Great value for the price, haven't found a better product for the cost. This cartridge gives the same quality print for half the price. I recommend this product to anyone who uses the Brother TN450 cartridge. This toner is good buy so I gave it a high rating, the original Brother toner is so much more expensive and there is really no difference except the price. I like that the shipping is free. I would recommend this toner to a small business such as mine. I have always been happy with my purchases from Ink Technologies. I have purchased Ink Technologies brand products for multiple different printers. Exceptional quality for a fraction of OEM. Enough said. The toner refills worked well and were priced right. will buy again. This toner is working very well in my brother printer. Compatible Toner Cartidge - Love It! Long lasting, great print quality. Great value for the price and I would and have purchased again. I feel the quality is as good as OEM. Value for price is the best around. Affordable price & great Product! We are very happy to have placed our order with Ink Technologies. We will order again! Super FAST shipping too!!!! Great Quality...easy to order... price was good. I purchased this cartridge before and once a again it is a dependable product. It works great. This product is great for this price!!!! Good service and I am pleased with the printing quality. This is an excellent substitute with great print quality. Easy ordering, free shipping, items available, quick delivery, good price. If this is your first Brother printer, remember that the cartridge actually sits inside the imaging drum. It comes out as one unit. Easy to remove the cartridge from the drum but can throw you off if not expecting this. Ink Technologies customer support picked up on that when I was just about ready to return these. Very helpful people there and the products are great as always. Highly recommend. Great value for the price, works very well. I am not sure yet if I get 550 pages out of it, time will tell. I found the product Excellent because it was the correct one for my printer, it arrived promptly, it delivered excellent print quality, and I feel confident it will produce many copies for the low price I paid. I have recommended Ink Technologies to a friend who does a lot of printing. We are a small community organization that offers free workshops and community education on "blight" and promoting Anti-Blight Initiatives. As a fundraiser, we made a community cookbook and found for maximum profit, self publishing was best. This is a great product!! The value and print quality is equivalent to the Brother product which is significantly higher priced. So far we have used 4 of the cartridges, we did notice some slight difference in the yield per cartridge, but the value is still there. Without Ink Technologies, we could not produce a quality product and earn more money in the process. THANK YOU INK TECHNOLOGIES!!! Very smooth print will recommend to my friends and family. Great price and Quality!!! The quality of the product surpasses the price. I will continue to order from you. This is an excellent product and a great value. The quality is as good if not better than OEM. I recommend this to anyone looking for toner. Very happy with the cartridge, it works great. Whenever any of my friends need printer supplies..I have the place for them! It was compatible, print quality was good. Price is good. I am happy. Very happy with performance of these cartridges. Flawless. I was concerned quality might not be good. NO PROBLEM! Quality is excellent. I saved big money over OEM products. Shipping was super fast and installation a breeze. I'm a new customer...for life. I received my product in a timely and the ordering process was very user friendly. I would definitely reorder again! Why spend $$$ on genuine Brother product, when you can save money on a Compatible one? This Toner is great. I use it in my Brother HL-2240D printer. I print high volume and am very satisfied with the quality of the merchandise.I order it all the time. Shipper is awesome too! I have had my Oki Data laser printer for years, and it just kills me to spend more on a cartridge then I paid for the printer new. Ink Technologies house brand, in my opinion prints darker and adheres better then original from Oki Data. I can't imagine spending almost twice just for the name. Great product, I would recommend. If you are looking for a great deal then check out this product. I bought a TN450 toner for brother HL-2240 printer. The toner is pretty good, and easy to install. This was my first time ordering. Everything was SUPER! Ease of ordering, delivery quickness and product were exceptional. No More STAPLES Store. Thank you!! Great Product! These cartridges are rated to last 2600 pages, but they are producing about 3000 pages! Very nice unit. Lasts long time. Great for our company. Awesome bargain. Searched all over the net. Best prices around!! Super fast shipping. Great product, saves us lots of money. These cartridges arrived promptly, in good shape and one of them is in use now. I would definitely reorder from this company. I received super fast service, great price. I will return on a regular basis. This is my third time purchasing these toners for our Brother HL-2240d printer and the price and print quality are excellent. On-time delivery, excellent quality, good quantity. This product works flawlessly in my HP laser and is extremely less expensive than a factory unit I will continue to buy from them for my spouses business all the time, awesome customer service when you call them. A video covering the new compatible TN450 toner cartridge, which replaces the original OEM Brother TN450 cartridge, including installation instructions. The TN450 is a high-yield toner cartridge that can provide up to 2,600 pages, based on an average of 5% page coverage. With a weight of around 1.8 pounds, it measures approximately 14.4 by 8 inches, and fits into a separate drum unit before installation. Unpack the new TN450 cartridge by removing it from the box and removing packing materials along with the bag, but keep the plastic cover on for now. You should rock the cartridge back and forth a few times to make the sure the toner inside is distributed evenly, then you can pry the protective cover from one side and remove it. Open the front access panel by pulling it toward you from both sides, then grab the handle of the cartridge and drum unit to pull and remove it. Place the assembly on a piece of paper to protect the surface and press the small lever on one side to remove the empty cartridge. Place the new TN450 cartridge into the drum unit and lock it down into place. Spin the drum assembly around so that you can clean the corona wire before you reinstall it. Slide the small tab back and forth several times, then lock it back into its original position. 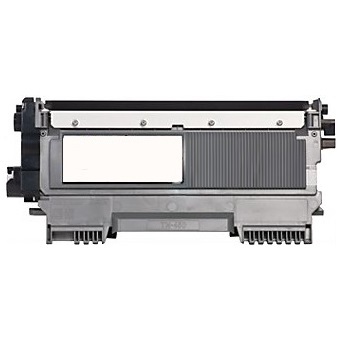 Place the TN450 toner cartridge and drum assembly into the printer, pressing to make sure it is seated properly, then close the front access panel. The Brother TN450 toner cartridge is compatible with a large number of Brother models, including personal laser copiers in the DCP-7060 series, compact printers in the HL-2130 series, and the HL-2150 and HL-2280 series. It is also compatible with multifunction devices like the MFC-7240, and fax machines like the Intellifax 2840. For a complete list of Brother TN450 compatible printers, see the “Fits Printer Models” tab.